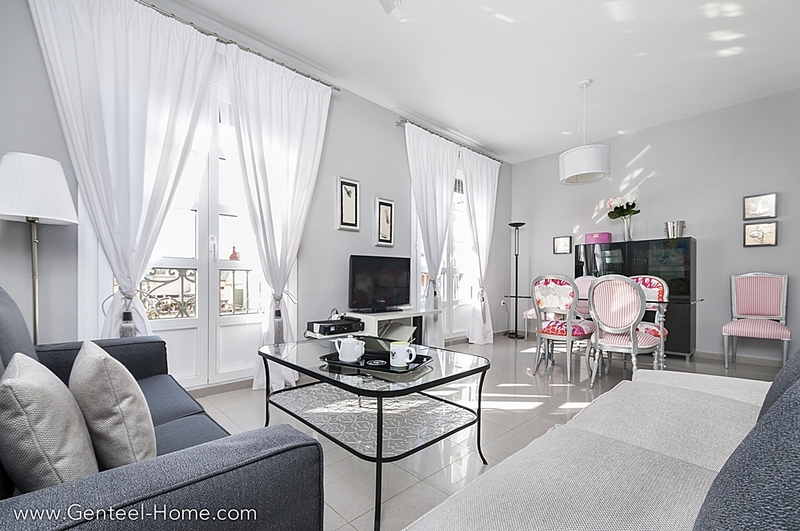 Luxury Apartments rental in Seville with Genteel Home, unique and picturesque. We have the best luxury apartments to enjoy all the colour of the city in the best areas of Seville. Choose the apartment, loft or penthouse that you like and start living an amazing holiday in Seville. 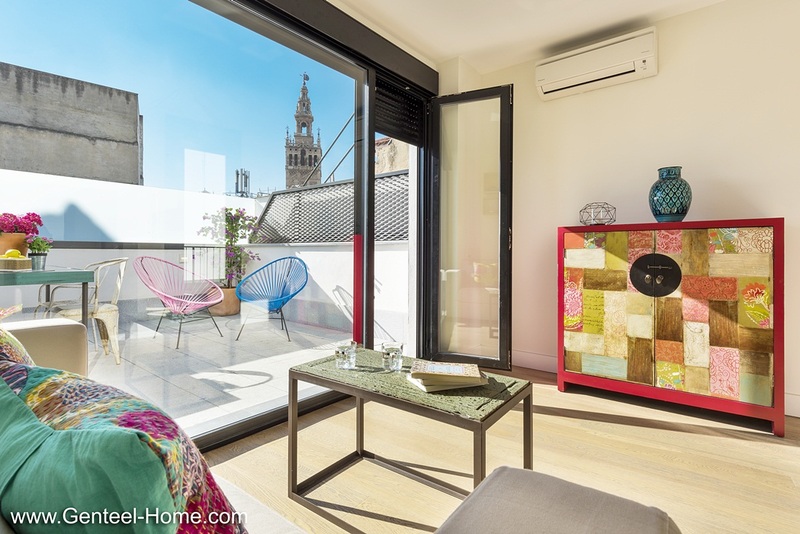 Beautiful penthouse located in the heart of Seville, in the old Jewish quarter – one of the most important historical places in Seville. Wonderful apartment with 3 bedrooms located in the heart of Seville, in the heart of the exclusive Arenal neighborhood. Beautiful apartment, with stylish decoration, and located in the best area of the center of Seville: El Arenal. 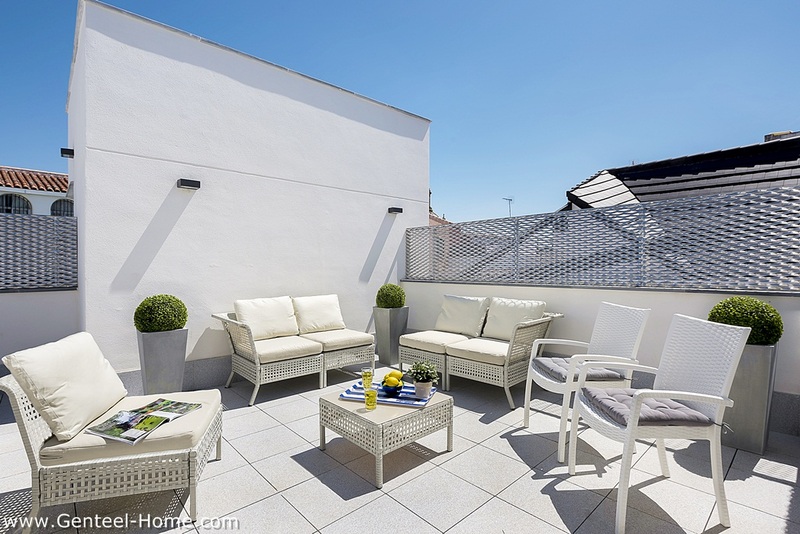 Beautiful apartment located in the heart of Seville with large private patio. Wonderful penthouse with two large private terraces located on Calle Baños, one of the most picturesque neighborhoods of Seville. Magnificent three bedroom apartment, located in the heart of the Santa Cruz neighborhood, in the most historic area of the center of Seville. Stylish and comfortable apartment in a great location, a step away from everything that it’s a must in Seville. Wonderful duplex apartment with 2 bedrooms, located in the most exclusive area of ​​Seville, the Arenal quarter. Beautiful and bright two bedrooms apartment, located in the central quarter of Santa Cruz, one of the best places to enjoy Seville with everything just a few steps away. Wonderful duplex with two bedrooms, and private solarium terrace with wonderful views of the Giralda, all in unbeateble location in the neighborhood of Santa Cruz. Beautiful house with traditional Sevillian style, fully restored, in an unbeatable location in the quarter of Encarnación. Beautiful, spacious and comfortable apartment with private terrace in a traditional place a few meters away from the Cathedral of Seville: an ideal place for a luxury holiday. Beautiful historic house situated in Arenal quarter in the heart of the center of Seville. Seville, with its 120 km of bike lane, has become one of the cities which support the most this means of transport. Its citizens also value all the advantages that bikes offer since, actually, 70,000 cyclists pedal daily in Seville. What could be better than discovering all the spots and secrets of the city throughout a nice tour by bike? You can enjoy outdoors the wonderful views, while making the most of the good number of advantages that bikes offer, not only for yourself, but also for the quality of life in general (environment, health, economy…). For these reasons, we have established an agreement with an amazing shop of bicycles called Confortbikes and we offer special prices for those who are interested, since we always want the best for all our clients. This bike rental business is situated in the street Real de la Carretería, nº 14 (on the corner with Toneleros). Its opening hours are: 10:30 – 13:30 and 16:30 – 19:30. –Tandem: in order to enjoy in good company. –With baby seats: in this way, children can have fun and enjoy a nice bike ride. The duration of the rental may last from 3 to 24 hours, so you can rental them depending on the time that suits you the best. Besides, they offer a tourist guide service (prior recruitment). In this way, the clients will contemplate the city with someone that will explain them the most interesting aspects of the city and of their monuments in great practical detail. 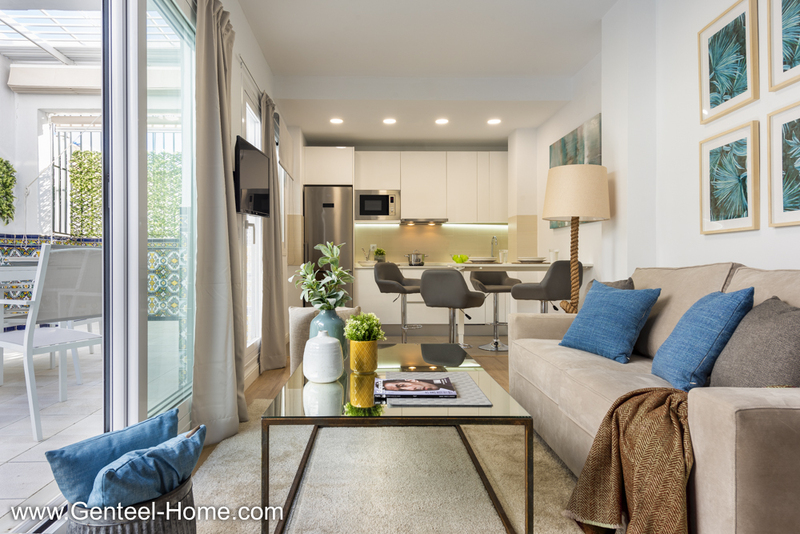 Genteel Home encourages you to think about going on a short trip to other nearby places, while you are staying in one of our luxury apartments in Seville. So you won’t only have the opportunity to get to know the capital city of Andalusia, but also to get to know better our region. Andalusia is home to unique places in the world, thanks to its outstanding features that make this region such a special place to visit. Therefore, we are aiming at making the search easier for you and we have narrowed the search to two categories: inland destinations on the one hand, and coastal destinations on the other hand. Located at the Mediterranean shore, this city which belongs to Málaga is situated in western Costa del Sol. This is one of the most important touristic cities on Costa del Sol and attracts people from all over the world thanks to its climate and its appropriate infrastructure for tourism. Furthermore, if you wish to go on a short visit, there are three main places that should not be missed: the old part of the city, Puerto Banús, which is a luxury marina, and the promenade, which houses statues created by Salvador Dalí. Thanks to its extraordinary location, Marbella enjoys a unique microclimate in Spain and Europe. This is thanks to the position of the mountains, just behind the coast, which makes the maritime climate prevail over continental climate. That is why Costa del Sol has an average temperature of 20 degrees throughout the year. Therefore, this city is home to a large number of sports facilities, among which it is worth highlighting its many golf courses. The fact that Marbella has become a benchmark for world tourism does not imply that it has lost either its historical essence or its typically Andalusian flavor. This is best illustrated by the fact that seafood is still the basis of the local cuisine specialties. In particular, the most traditional dish is pescaíto frito (fried fish) or espeto (roasted fish) made out of anchovies, horse mackerels, red mullet, squids,…). Gazpacho (tomato-based vegetable soup) and ajoblanco (soup served cold accompanied by grapes or melon chunks) are also very traditional. Bathed by the Atlantic Ocean, this city, which belongs to the province of Cádiz, is located on Costa de la Luz, which is, at the same time, shared by Cádiz with the province of Huelva. The coast of Chiclana has many beaches, being La Barrosa the most important one. The beaches of Chiclana are its best tourist heritage, which has led Chiclana to become a place where many visitors decide to come back every year. Furthermore, its beach bars turn into the perfect meeting point so as to taste any recipes of this place. All this has led Chiclana to receive the recognition of being the number one destination within the province of Cádiz. Located in Chiclana de la Frontera, La Barrosa is one of the most popular beaches in Spain, thanks to the quality of its sand, its easy accessibility, the wide variety of services that offers as well as its many unspoilt spots. Furthermore, ever since 1988, this beach has been receiving the Blue Flag certification. Its beautiful sunsets with views of Sancti Petri castle in the background, its blue water, its golden sand, the quality seals that guarantee it,… all this features come together to make La Barrosa one of the best beaches in Spain. Bathed by the Atlantic Ocean, Rota is a place mainly focused on tourism, to where hundreds of thousands of people who are looking for sunny beaches go every year. Rota is surrounded by 16 kilometers of beach, with its fine and golden sand in addition to its clean and crystal-clear water. Thus, Rota consists of two urban beaches: La Costilla and El Rompidillo, both with superb promenades. On the other hand, it also has natural beaches as Punta Candor, Los Corrales and La Ballena, which is next to the tourist resort of Costa Ballena. Rota offers a comprehensive programme of cultural activities, sports and celebrations throughout the year: the carnival (February), the Holy Week (April), the Feria de la Primavera (May), the Fiesta de la Urta (August) and Fiestas Patronales (October). On the other hand, you can also visit the Castillo the Luna castle, Ntra. Sra. De la O parish, La Merced tower,….You can also do a number of activities during your leisure time (windsurf, golf, sailing,…) as well as going into the natural path of the Vía Verde route in Rota. Furthermore, Rota has excellent roads and communications, which will make your journey from Seville easy and faster. Finally this city offers the visitor a rich and varied gastronomic offer based on local products, as in urta a la roteña (sea bream with vegetables), arranque roteño (vegetable-based soup with bread, similar to gazpacho), cabbage and the well-known wine tintilla de Rota. Located on Costa de la Luz coast, Costa Ballena is one of the most advanced tourist areas in Europe, thanks to its over 4 kilometers of unspoiled beaches with clean and crystal-clear water. Just one quarter of the land used by Costa Ballena is built, whereas the rest is intended for green areas such as parks, lakes, gardens, beaches, vegetable patches and golf courses. In Costa Ballena there is the possibility to play golf, do water sports, hiking, enjoying nature…more than you could possibly imagine! Located on Costa de la Luz coast and situated between Lepe and Isla Cristina, Islantilla is in one of the most special places in Andalusia, since it is surrounded by marvelous spots. Its soft climate, its rich gastronomy and its natural environment turn Islantilla into an idyllic destination. This wonderful enclave has been given a number of quality labels that guarantee its amazing golden beach, as it has received the Q for tourism quality (the maximum quality label in Spain at the moment), the Blue Flag and Ecoplayas prize, among others. The popular sport par excellence is golf, as Islantilla is home to one of the best golf courses in the south of Europe, after water sports. Furthermore, this “garden” next to the ocean offers the possibility to go hiking in the rural tracks in this area as well as to go into the neighbouring natural environments. If you need more information on excursions, trips or organized tours to these places, please do not hesitate to contact Genteel Home by clicking here. Our staff will help you with any questions you may have in this regard, since we have an agreement with travel agencies that organize this kind of trips. We are here to help you with whatever you may need in order to help you as much as possible during your stay in Seville. It is said that Seville has a special color… and it is true. Seville is a magical city where you will feel history in the air. One of the most important cultural heritages that you can find here is “flamenco”. Serafín Estébanez Calderón was the first writer who described it, nearly two centuries ago, in his book “Escenas Andaluzas” (Andalusian Scenes) like a typical dance in “Triana”. Since then, Seville is considered the cradle of this art style because it is the first place where flamenco was documented; although it is not sure that the flamenco was born here. In this city, which combines many settled traditions and the beginning of a cosmopolitan town, you will find many places to enjoy this art, declared Intangible Cultural Heritage of Humanity by UNESCO. Flamenco in Seville can be felt not only in the flamenco venues, but also in the theatres (highlighting the Teatro Central, where the artistic trends of avant-garde are assembled), and the neighbourhoods clubs, where artists and students discover their secrets. Among all the tourist attractions that you can find in Seville, flamenco is clearly one of the most interesting, since it attracts a lot of tourists. Seville offers many possibilities to the flamenco lovers who want to enjoy a high-quality show. There are renowned flamenco venues (“tablaos”) thanks to many years of tradition, where dancing figures, such as Lola Flores or Manuela Vargas, have made known. Besides, there are “tablaos” that have been founded by famous dancers, such as Curro Velez and his “Tablao Arenal”. Moreover, anonymous artists get together to practise singing, dance and guitar in pubs and clubs, every night in Seville. These are also the meeting place for many young flamenco figures who want to measure their strength, learn and improve their skills. In these associations, they find the opportunity to rise to fame. One of the most important year event in Seville (regarding this art), is the performance of the Bienal de Sevilla (Seville Biennial). The flamenco lovers must come to this event where more than 70 artists perform 20 performances approximately. Dancers, guitarists, singers and clappers arrive from all corners of the world in order to demonstrate their skills. During the Feria de Abril (Sevilla Fair), Seville wears ruffled lanterns, ruffled skirts and “albero” (golden sand) for welcoming visitors singing and dancing “sevillanas” (typical dance). The most important week of the year usually takes place in April, and you can enjoy the cuisine, the horse rides on the “Real” and the magical lighting overnight. Last but not least, for those who want to experience the passion of flamenco from another point of view, there is also the possibility of attending training centres where learning the more hidden flamenco secrets. From associations to private schools: a lot of places for learning flamenco dances, “cante jondo”, guitar and castanets. 5. Where can you take Flamenco lessons? Over the years, enjoying a good meal in Seville has become an intense tribute to one of the most rooted customs of this city. Typical Andalusian cuisine includes a wide variety of dishes, all very linked to the Mediterranean Diet. The fruits from this region, all connected to the different cultures that have been in Seville, have led to a perfect combination that will make discover a new world to your palate and that attract people from all over the world to come to taste all the different nuances of its flavours. As a result, cuisine and Seville become the perfect pair, thanks to the riches of the cooking resources from all the Andalusian provinces as well as to the variety of dishes and the different methods of preparation, already recorded in reports of anonymous travellers during the 17th and 18th centuries. Sevillian cuisine is influenced by the Andalusi culture, above all when it comes to seasoning or mixing the ingredients. Eating is perhaps the feature that best defines the nature of Andalusian people. Sitting at the table becomes an opportunity to talk and to enjoy. Therefore, eating with the family has become a feature of Spanish culture and helps reinforce personal relationships as well as to eat in a healthier way. If there is a saying that best defines the cooking variety of Seville is the one that goes "Variety is the spice of life". There is just left to say: Enjoy your meal in Seville! The Romans, who arrived in Seville leaded by the Roman general Scipio during the Second Punic War in the 206 BC, founded the city of Itálica (in Santiponce, Seville). Once the Carthaginians were defeated, the Romans named the city "Híspalis" and, alongside Itálica, were the center of the southern half of Hispania during the Roman period and they witnessed the government of important emperors such as Trajano and Adriano. Seville, despite being the capital of Andalusia, gathers most of its monuments and sightseeing attractions together in the city center. This, apart from making it quite an accesible city, turns it into the perfect place to be visited on foot. Walking along the narrow streets allows the visitors to discover gorgeous, hidden nooks and to enjoy the nice atmosphere of the city. There is a comprehensive network of buses, as well as metro and tram services aimed at making the access to other parts of the city easier. Seville Airport also provides domestic and international flights on a regular basis in addition to an efficient taxi service. If you want to enjoy the gardens, narrow streets and parks, you can also make use of bicycles, since there is an extensive network of cycleway (Sevici) all over the city.